Do you remember how much fun you used to have cycling as a child? We want to ensure that children today have the same opportunities and independence that our bikes gave us. 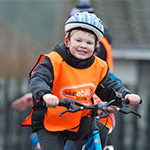 Bikeability Scotland is a cycle training scheme, usually delivered in schools between P5 and S2, that teaches children to cycle safely, to learn how to deal with traffic and that, above all, gets children excited about cycling. There's also a Gaelic version of the Parents' Guide here. If your child's school doesn't currently offer Bikeability Scotland, why not speak to them and ask if they can consider doing this? 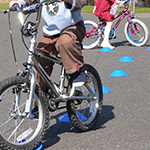 They can log onto this website to find out how to start a Bikeability Scotland programme. Which schools deliver Bikeability Scotland? 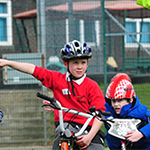 Does your child's school deliver Bikeability Scotland cycle training? Find out here, on our interactive map of Scotland*. You can filter by level of training, or, if all levels are selected, the highest level delivered will be shown. Please be aware that due to some schools delivering biennially, delivery may only be shown as occurring every other year. 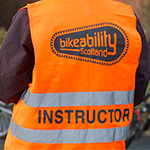 If the school you're looking for doesn't appear here, and you're interested in supporting them to start delivering Bikeability Scotland, please click here to find out more. * Delivery data is updated at the end of the academic year.